Crime writer Graham Smith has organised a great course for all of you crime writers out there. Zoe Sharp, Darren Laws, Chris Ewan and more top talent are invloved. 'Looking to improve your writings skills? 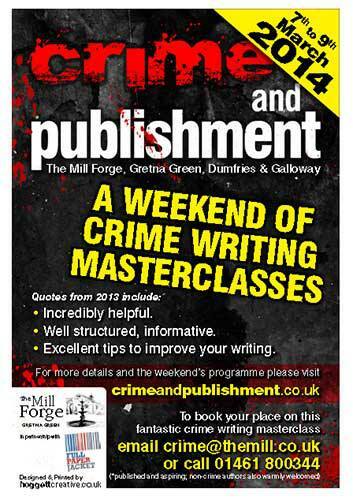 Then you may want to check out Crime and Publishment - a weekend of masterclasses and workshops designed to improve your skills as a writer. Join bestselling authors who will share valuable insights and tips. Attendees are also taught how to pitch to a publisher, by a publisher before getting a chance to make their pitch. 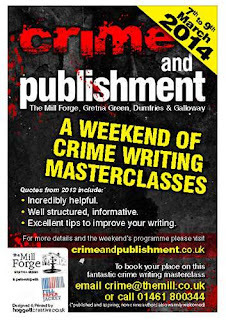 Crime and Publishment, creative writing courses will be held at The Mill Forge Hotel on the outskirts of Gretna Green, Scotland and will run from the 7th to the 9th of March 2014. Places are limited so book early to avoid disappointment.